The Cologne Cathedral (German: Kölner Dom, officially Hohe Domkirche St. Peter und Maria) is renowned as a monument of Christianity, of Gothic architecture and of the faith and perseverance of the people of Cologne. 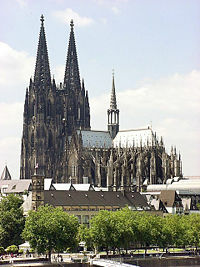 It is the seat of the Archbishop of Cologne, under the administration of the Roman Catholic Church. Located beside the Rhine river it is dedicated to Saint Peter and the Blessed Virgin Mary. Cologne Cathedral is one of the world's largest churches, being the largest Gothic church in Northern Europe. Even though construction was begun in 1248, it wasn't completed until 1880. For four years, 1880-1884, it was the tallest structure in the world, until the completion of the Washington Monument followed by the Eiffel Tower. It has the second-tallest church spires with a height of 515 feet, only surpassed by the single spire of Ulm Cathedral, completed ten years later in 1890. Because of its enormous twin spires, it also presents the largest facade of any church in the world. It was named a World Heritage Site in 1996, being one of the best-known architectural monuments in Germany, and Cologne's most famous landmark. The massive facade was left incomplete for 400 years. In 1996, the cathedral was added to the UNESCO World Heritage List of culturally important sites. In 2004 it was placed on the "World Heritage in Danger" list due to nearby high-rise building and its visual impact upon the site, as the only Western site in danger. The cathedral was removed from the List of In Danger Sites in 2006, following the authorities' decision to limit the heights of buildings constructed near and around the cathedral. The Cathedral was selected on the basis of cultural criteria and based on consideration of the fact that the monument has outstanding universal value as an exceptional work of human creative genius. It was also chosen because the more than six centuries it took to complete it serves as a powerful testimony to the strength and persistence of Christian belief in medieval and modern Europe. 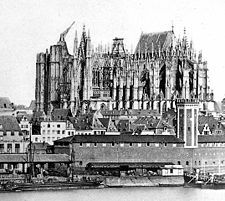 Before construction on Cologne Cathedral commenced in 1248 the site had been occupied by several previous structures. It stands on the site of a 4th century Roman temple, followed by a square church known as the "oldest cathedral" commissioned by Maternus, the first Christian bishop of Cologne. A second church built on the site, the "Old Cathedral," was completed in 818. This burned down on April 30, 1248. In 1164, the Archbishop of Cologne, Rainald of Dassel had acquired relics of the Three Kings which had been taken from Milan in Italy by the Holy Roman Emperor, Frederick Barbarossa. The relics had great religious significance and could be counted upon to draw pilgrims from all over Christendom. It was important that they were properly housed. The loss of the old five-aisled cathedral prompted a building program in the new style of Gothic architecture based in particular on the French Cathedral of Amiens. The foundation stone was laid on August 15, 1248, by Archbishop Konrad von Hochstaden. The eastern arm was completed under the direction of Master Gerhard, was consecrated in 1322 and sealed off by a temporary wall so it could be in use as the work proceeded. In the mid-fourteenth century work on the west front commenced under Master Michael. This work halted in 1473 leaving the south tower complete up to the belfry level and crowned with a huge crane which was destined to remain in place, and the landmark of Cologne for 400 years. The Cathedral in 1856 showing the unfinished South Tower with its ancient crane, the Gothic eastern end and south transept. 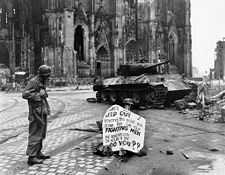 An American soldier and a destroyed Panther tank in front of the cathedral on 4 April 1945. With the nineteenth century romantic enthusiasm for the Middle Ages and spurred on by the discovery of the original plan for the facade, it was decided, with the commitment of the Prussian Court, to complete the cathedral. It was achieved by civic effort as the Central-Dombauverein, founded in 1842, raised two thirds of the enormous costs (over US$ 1 billion in today's money), while the Prussian state supplied the remaining third. The construction restarted in 1842 using the original design of the surviving medieval plans and drawings, but utilizing more modern construction techniques including iron roof girders. The nave was completed and the towers were added. The cathedral suffered 14 hits by aerial bombs during World War II but did not collapse and remained standing in an otherwise flattened city. The repairs to the building were completed in 1956. In the northwest tower's base, an emergency repair carried out with bad-quality brick taken from a nearby war ruin remained visible until the late 1990s as a reminder of the War. Repair and maintenance work is almost constantly being carried out in some section of the building as wind, rain, and pollution slowly eat away at the stones. On August 25, 2007, the cathedral received a new stained glass in the south transept window. With 113 square meters of glass, the window was created by the German artist Gerhard Richter. It is composed of 11,500 identically sized pieces of colored glass resembling pixels, randomly arranged by computer, which create a colorful "carpet." Since the loss of the original window in World War II, the space had been temporarily filled with plain glass. The archbishop of the cathedral, Joachim Cardinal Meissner, who had preferred a figurative depiction of twentieth-century Catholic martyrs for the window, did not attend the unveiling. 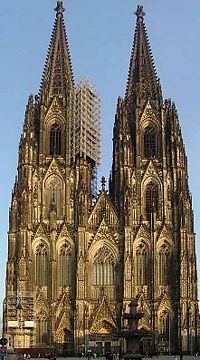 The design of Cologne Cathedral closely resembles that of Amiens Cathedral in terms of groundplan, style and the width to height proportion of the central nave. The plan is in the shape of a Latin Cross, as is usual with Gothic cathedrals. It has two aisles on either side, which help to support one of the highest Gothic vaults in the world, being nearly as tall as that of the Beauvais Cathedral. Externally the outward thrust of the vault is taken up by French-style flying buttresses. 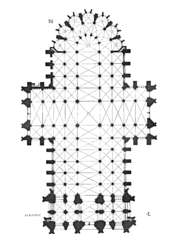 The eastern end has a single ambulatory, the second aisle leads into a chevet of seven radiating chapels. Internally, the Medieval choir is more varied and less mechanical in its details than the nineteenth century building. It presents a French style arrangement of a very tall arcade, a delicate narrow triforium gallery lit by windows and with detailed tracery merging with that of the windows above. The clerestory windows are tall and retain some old figurative glass in the lower sections. The whole is united by the tall shafts which sweep unbroken from floor to their capitals at the spring of the vault. The vault is of plain quadripartite arrangement. The choir retains a great many of its original fittings, including the carved stalls. A 12.5 foot stone statue of Saint Christopher looks down towards the place where the earlier entrance to the cathedral was, before its completion in the late nineteenth century. 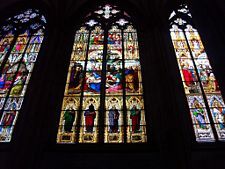 The nave is enhanced by many nineteenth century stained-glass windows including a set of five on the south side called the "Bayernfenster" which were a gift from Ludwig I of Bavaria, a set highly representative of the painterly German style of that era. The arcade, gallery and clerestory of the east end. 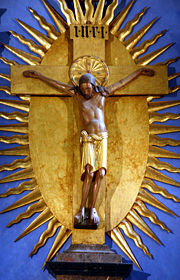 The Crucifix of Bishop Gero, a famous tenth century sculpture, with a modern surround. 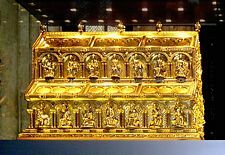 The most celebrated work of art in the cathedral is the Shrine of the Three Kings, a large gilded sarcophagus dating from the thirteenth century, and the largest reliquary in the Western world. It is traditionally believed to hold the remains of the Three Wise Men's bones and 2000-year-old clothes. These relics put the city on the pilgrimage map. Archbishop Rainald of Dassel brought the relics of the Three Magi from Milan to the Cathedral of Saint Peter in Cologne in 1164. 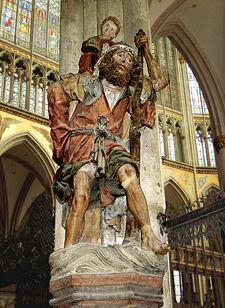 During his journey, Rainald wrote to the people of Cologne that he was bringing with him relics of the Magi seized from the city of Milan after its destruction, which were given to him by the Emperor Frederick I Barbarossa. That the relics had been looted by Barbarossa following the sack of Milan was not widely advertised at the time. Archbishop Reinald was mostly interested in their symbolism: the possessor of the Three Kings or the Three Wise Men possessed the kingdom of Christ, and became kingmaker himself. From that time on, until the sixteenth century, every German king traveled straight to Cologne from his coronation in Aachen, to bring gifts to these first Christian kings, as Otto IV did for the first time when he donated the gold and jewels for the front end of the reliquary. Since the Three Kings were the first monarchs to be recognized by Christ's, so, too, the Christian kings of Germany wished a similar recognition. The scholar Patrick Geary has claimed that there was no cult of the Magi in Milan before 1164. The three skeletons taken by Rainald of Dassel from the Church of Sant Eustorgio were unidentified. On his way from Milan back to Cologne, Rainald invented the history of the cult of the Magi in Milan and accordingly identified the relics as those of the Three Wise Men. The reason being to establish the city of Cologne as the equal of Oxen, the seat of the Emperor, by developing a cult equal to that of Charlemagne, and by this means to secure the independence and status of the archbishops of Cologne. Near the sacristy is the Gero-Kreuz, a large crucifix carved in oak and with traces of paint and gilding. Believed to have been commissioned around 960 C.E. for Archbishop Gero, it is the oldest large crucifix north of the Alps and the earliest-known large free-standing Northern sculpture of the medieval period. In the Sacrament Chapel, is the Mailänder Madonna ("Milan Madonna"), dating from around 1290, a wooden sculpture depicting the Blessed Virgin Mary and the infant Jesus. 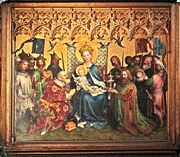 The altar of the patron saints of Cologne with an altar piece by the International Gothic painter, Stephan Lochner is in the Marienkapelle ("Saint Mary's Chapel"). In 2000, the Cathedral’s treasures were placed in the Treasure Chamber, a historic vaulted chamber dating to the thirteenth century (North side of Cathedral chancel). The treasures include precious reliquaries, liturgical articles, robes and insignia of the archbishops from the fourth to twentieth century as well as medieval sculptures and finds from Frankish tombs. This medieval statue of Saint Christopher, Patron of Travellers, welcomes visitors to the Cathedral. The interior of the Cathedral is a gallery of ancient art that includes the unusually large carved altar known as "Agilolphus." It was created around 1520 in Antwerp, then well known as the center of this craft. It focuses on the life and passion (i.e., torture) of Jesus, presented in three-dimensional carved scenes. The choir benches (also called choir stalls) are works of art themselves, but they can only be viewed from the ambulatory (the passageway in back of the choir) through the railings. Carved from 1308 to 1311, the benches are still regarded as the most beautiful in Germany. With 104 total benches they form the largest existing set. Above the choir benches are large screens covered with a series of paintings. These are the oldest examples of the Cologne School of painting, created between 1332 to 1340. Standing on small shelves richly decorated with colorful leaves are numerous statues, positioned at each pillar around the choir 20 feet above the floor. The statues represent Christ, the Virgin Mary, and the 12 apostles. They were made by the cathedral workshop at its height during the period of around 1270—1290. Above each statue are canopies upon which 12 angels stand, each holding a different musical instrument. 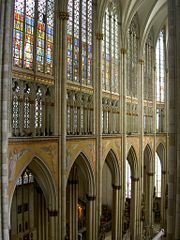 The clerestory windows in the choir of the Cologne Cathedral, with 10,170 ft. of glass surface, contain the largest series of stained glass windows still extant from the fourteenth century in Europe. The windows were completed before the choir stalls were installed in 1311. Ninety-five percent of the glass is original. The cathedral has eleven church bells, of which three are Medieval. The first was the 3.8-ton Dreikönigenglocke ("Bell of the Three Kings"), cast in 1418, installed in 1437, and recast in 1880. Two of the other bells, the Pretiosa (10.5 tons; at that time the largest bell in the Occident) and the Speciosa (5.6 tons) were installed in 1448 and remain in place today. The largest bell, the 24-ton St. Petersglocke ("Bell of St. Peter,"), was cast in 1922 and is the largest free-swinging bell in the world. At the 700-year anniversary Cathedral celebration in 1948, the bold Cathedral organ, with its innovative location, was introduced. Although an organ fitted with 68 registers (+ 2 derived stops) and 3 manuals had been adequate in 1948, the instrument was enlarged, with a fourth manual, to 86 registers (+2 derived stops). Further register changes and additions were made thereafter. In 1984 the console, dating from 1956 was equipped with separate combination system controls. The swallow's nest organ high up in the nave was added in 1998 for the Cathedral's 750-year anniversary, it is located in the position where an organ would probably have been placed in the Middle Ages if a similar solution had then been possible. World Youth Day 2005: there were nearly one million visitors. 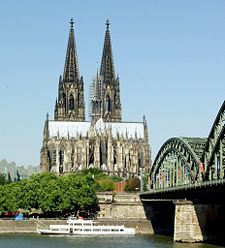 As a World Heritage Site, and with its convenient position on tourist routes, Cologne Cathedral is a major tourist attraction, including many who travel there as a Christian pilgrimage. On May 12, 2001, the American rock band R.E.M. performed a free concert in Roncalliplatz, the square to the south side of Cologne Cathedral. The concert was organized to promote the eradication of violence in schools, and was in part broadcast live on MTV Europe. 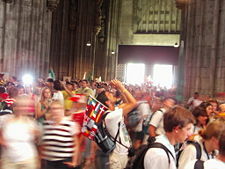 On August 18, 2005, Pope Benedict XVI visited the cathedral to participate in World Youth Day 2005 festivities. An estimated one million people visited the cathedral during this time. As part of the events of World Youth Day, Cologne Cathedral hosted a televised gala performance of Beethoven's Missa Solemnis, performed by the Royal Philharmonic Orchestra and the London Philharmonic Choir conducted by Sir Gilbert Levine. 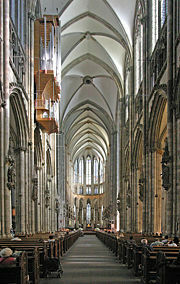 The north transept seen from Kölner Hauptbahnhof reveals the taller central space framed by lower aisles, spanned by flying buttresses. The main entrance shows the brittle repetitive nature of the nineteenth century decoration. The flying buttresses and pinnacles of the East end. Inside the roofspace steel girders rise above the stone vaulting. Detail of a window showing the patrons of the Cathedral, Saint Peter and the Virgin Mary. A lightshow in the Cathedral. photo F.Feldhoffer. Petersglocke Note person to right of bell clapper. ↑ Cologne Cathedral (Kölner Dom) Sacred-destinations.com. Retrieved July 27, 2008. ↑ UNESCO World Heritage Sites. Cologne Cathedral. Retrieved October 22, 2008. ↑ Cologne Cathedral (Kölner Dom) Sacred-destinations.com. Retrieved July 28, 2008. ↑ Wim Swaan gives the latest date as 1560, but a date of 1520 is considered more probable by other scholars. ↑ Amanda Fortini, Pixelated Stained Glass. The New York Times, 2007-12-09 retrieved July 29, 2008. ↑ The Shrine of the Magi travelgermanyinenglish. Retrieved October 22, 2008. ↑ The Cathedral Interior Travelgermanyinenglish.com. Retrieved July 29, 2008. ↑ The World Peace Bell in Newport, Kentucky is larger, but turns around its center of gravity rather than swinging about its top. ↑ The Bells of Cologne Nme.com. Retrieved July 29, 2008. ↑ Hans-Wolfgang Theobald. The Organs in Cologne Cathedral—Their Conception and Function Koelner-dommusik.de. Retrieved August 7, 2008. (English)(German) Cologne Cathedral Official website Koelner-dom.de. Kipphoff, Petra. 2007. Coincidence and Illumination Signandsight.com. Cologne Cathedral in the Structurae database En.structurae.de. This page was last modified on 11 March 2017, at 00:33.